Pill pushing has inevitability in the best of all possible worlds. It brings good and bad. It reflects the free enterprise that built the modern world. The bonanza of effective medication that capitalism produced seen besides the insignificant output of communist Russia and its satellites gives some measure of its effectiveness. Besides drugs that have radically improved the ability to fight infection and resist heart disease, the drug manufacturers (Big Pharma) have produced many failures such as thalidomide. Failure we expect, but even after learning of them manufacturers continued to promote the dangerous substances with marketing no less effective than that they devoted to the best validated of their merchandise. Understandably the dominant meme, “profit or perish”, dictates that response. To optimise the benefit Big Pharma can bring, society has to exercise careful restraint on free enterprise. Sadly, a successful combination takes time to develop. Restraint necessarily lags behind the enterprise that needs control. Many victims of thalidomide still wait for their promised compensation. I entered psychiatry when Big Pharma delivered a marvellous boon, chlorpromazine, a drug that rapidly calmed the agitated insane. I watched it transform the lunatic asylum. For a while I shared the hope that drugs would overcome schizophrenia, but learned to accept that they do no more than make life easier for patient and carer. Then came the the mood lifters and the mood downers in a flood that besotted a generation. Big Pharma grew exponentially until it dwarfed the dye industry that founded it. I watched as the diagnostic net of psychiatry expanded to encompass the population, young and old, and justify flooding it with medication. What conclusion should we reach about illnesses that increase parallel with an enormous increase in their treatment? 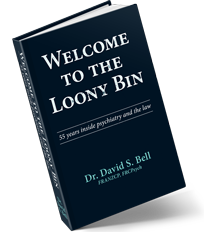 In the 1990s I encountered more and more cases of medication-induced mental disorder. Many publications document the increase in medical poisoning: neuroleptic toxicity, the serotonin syndrome, akathisia and the like. I watch psychiatrists deliver enormous doses to patients, who become worse. Instead of recognising error, with lop-sided reason the therapists take deterioration to justify giving even more of the same. Once well-known as reprehensible, the combined use of many drugs, polypharmacy, has become routine. I encountered relatives, who had tried every means to persuade psychiatrists that the treatment made their family member worse before finally resorting in frustration to the courts. One set of parents even mustered a support group that demonstrated outside Parliament. I have not seen a single appeal to reason succeed. The psychiatrists, overwhelmed with admissions to hospital and eager to discharge patients as soon as possible through the revolving door, instead of letting their victims go hung on tenaciously to their revealed failure. The challenge to their authority, or the criticism of their acumen, made them the more determined to continue. The memes of their group hold them in thrall. They maintain their hold on their victims using powers of compulsion conferred by compliant legislators.